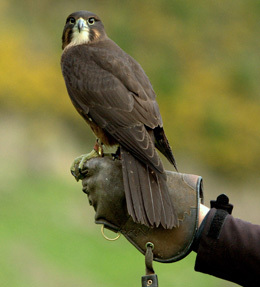 Injured birds of prey rehabilitation. Those that are not too badly injured are treated by our team of experts and, once fit, released back into the wild. Birds that are too injured to be released, but fit enough to be kept in captivity in a healthy condition, are incorporated into our captive breeding programme. It is from these birds that the chicks are produced for release into the wild – so although they are not able to be released, they still contribute significantly to their species' recovery! Found an injured bird of prey and need help? 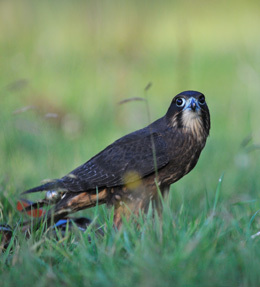 Injured birds of prey should be placed in a cardboard box or cat-box as soon as possible. Place an old towel or T-shirt in the box to stop the bird sliding around and to give it something to grip onto. Keep the inside of the box dark while maintaining plenty of air flow. Above all keep the bird out of direct sunlight and for both yours and the bird’s sake keep handling to a bare minimum. 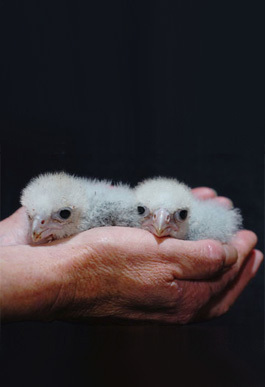 The bird will be highly stressed and will want to defend itself, especially with its talons – excessive handling can hurt both you and the bird. Letting the bird grab hold of an old towel with its feet, then wrapping the birds wings in the towel to pick it up and put it in the box, can be an effective way of ensuring the feet are kept out of harm’s way. Use both hands when picking a bird up and if possible get someone to help you put it safely into the box. Once secured in a suitable box, take the injured bird to your local DOC office immediately. Encourage the DOC staff receiving the injured bird to contact us at the Wingspan National Bird of Prey Centre in Rotorua. If a dead bird is found with a band on its leg, remove and flatten the band, note the time, cause of death if known, date and place the bird was found and forward the band and its details to the Banding Office. Never attempt to remove a band off a live bird – they are not designed to be easily removed and you will most likely break the bird's leg.